XO Music Festival 2018 is around the corner! With only 5 days left to this year’s festival, fans by the hundreds are getting ready to enjoy fun in the sun this coming weekend. The festival Features headliners Ludacris, TI, Bone Thugs-N-Harmony, The Diplomats, Mistah F. A. B. and more. 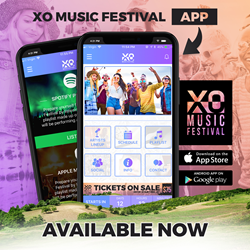 In celebration of the freshest summer music festival the XO Music Festival team proudly announces the release of the new XO Music Festival mobile app that’s currently available for download in the App Store and Google Play. The mobile app is a sleek user-friendly way to navigate through next week’s stacked schedule along with all the other things going on at the event. With so many of the industry’s greatest artists gathering in one place, it can be an overwhelming process, but this tool keeps fans organized and allows the user to create a personalized schedule of the acts festival goers want to see. While it can’t alter moments when two favorites are performing at the same time, at least the app’s push notifications will keep users informed of when they’ll hit the stage. Seriously, if you’re still going about checking times on a paper lineup, that needs to change. To get fans even more pumped up for what’s to come, you’ll also find curated playlists of tracks featuring stars from this year's lineup. But note that it will only work for those with an Apple Music or Spotify account. These cool musical selections will keep users celebrating the festival’s headlining artists all weekend and beyond. Make sure to bring headphones because you’ll have plenty to listen to on your trip down to Antioch! Since the app is in it's early stages, expect new updates almost on a daily basis. Updates include artist times, cool promo messages, ultimate backstage vip giveaway and more. Get the app and go to the festival!